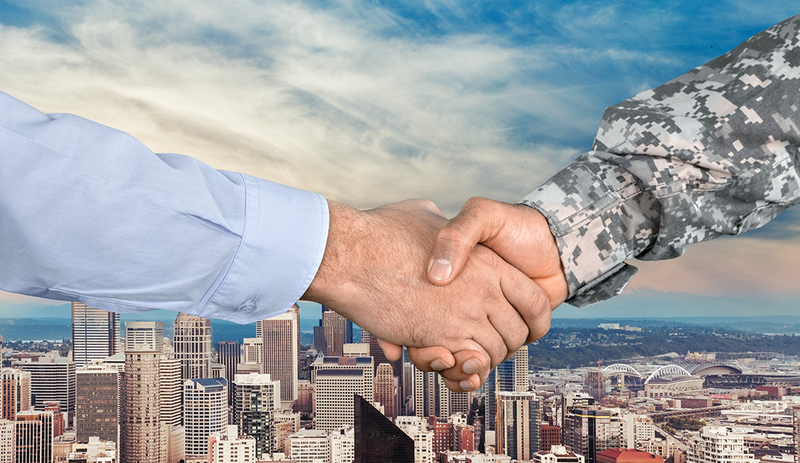 Veteran recruiting events might follow the same basic template as standard job fairs, but they necessitate that employers take a slightly different approach to recruiting prospective employees. The job seekers at a veteran recruiting event used to serve or are currently serving in the military. You can expect them to approach their civilian job hunts in an assertive and organized manner, so offer on-the-spot job interviews and/or ensure your follow-up is just as aggressive. You can’t make veteran job seekers wait days or weeks for a phone call or email indicating your interest. They’ll have moved on by then. You should also be sure you know the ins and outs of any veteran-specific programs your company may offer. Your prospect will be comparing your company to the others in attendance to see which ones really stand behind their stated commitments to veterans. If at all possible, you should accept resumes from job seekers during the event. If you cannot do so for any reason, clearly explain why you can’t and how candidates can apply online instead. If job seekers have to apply online, consider allowing them to apply right at your booth, with guidance from a company rep. If you can accept neither resumes nor applications at the event, gather the job seekers’ contact information and schedule interviews immediately after the event. As with any recruitment event, you want to send your friendliest and most approachable people to represent the company. For many attendees, this will be their first foray into the civilian recruitment world. It can be scary and intimidating. If you can send veteran employees, even better. They can relate closely to job-seeking veterans at the event. Some events will allow spouses and families of veterans to attend. Many military spouses may also be making their first entrances into the civilian business world, and they may not have much work experience behind them. Military families often have to move around a lot, which can prevent military spouses from establishing careers. Focus on their volunteer experience or their membership in groups and clubs to determine whether they might fit your company. Your collateral should answer every question a veteran might have about your company and your open roles. If you have veteran employees on staff, it can be helpful to share their stories of transitioning to your company in the form of a video or brochure. Whether you’ve been involved in veteran recruiting for a while or are just diving in, you need to know what other companies in the field are offering. Many companies have been doing this for years. They have established perks, programs, and resources tailored to the needs and wants of veteran job seekers. Do you have comparable offerings? One of the big hurdles many veterans face in transitioning into the civilian workforce is translating their military skills into civilian terms. Many veterans don’t yet speak “civilian,” and many recruiters don’t understand military jargon. You should be able to help veterans with this, perhaps by offering a “cheat sheet” that helps veterans translate their skills. You can also bring a “translator” – someone well versed in both languages, perhaps a veteran employee of your own – to ensure conversations run smoothly. When attending a veteran job fair, consider how much time and effort the job seekers have made to be there. The military isn’t known for its flexible hours, so attendees often have to take time off of work – not to mention all the preparation of buying clothes, writing resumes, and even job-coaching sessions. As a result, veterans don’t have much time to waste on jobs that sound great but don’t match their skills. Stick to the positions that really suit them. Instead of just pitching your jobs, be a resource for the attendees. Offer them resume pointers, interview advice, and other insights to help them in their searches. You can hold these sessions right at the booth. Veteran job seekers will see you as genuinely interested in their success, rather than just another company selling a role. Standard swag like pens and stress balls are great, but what about things that can really change someone’s day? Consider offering bigger prizes, like an interview fast track or a book on transitioning out of the military successfully. A version of this article originally appeared on the WCN blog. Jeanette Maister is managing director of the Americas for WCN.